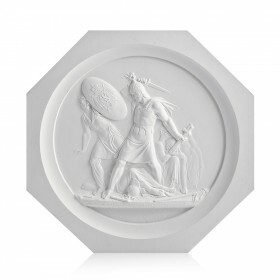 Apart from decorative plates, the walls at your home could be adorned with plaster medallions created on historical, biblical and antique subjects. In the collection of the State Hermitage Museum there are many bas-reliefs, sculptures and medallions produced on the theme of the 1812 War with Napoleon, medallions by Fiodor Tolstoy made in allegorical style and devoted to famous battles. Copies of these pieces will decorate your study or drawing-room, imparting an air of seriousness and importance to them.